Known as the "Mango Capital of the Philippines" for its sweetest tasting mangoes that are even served in the White House and Buckingham Palace, Guimaras Island is part of Metro-Iloilo Guimaras which is located in the Western Visayas region. It is so fun in this beautiful island, where travelers must see their awesome beaches, islands, marine reserve, caves, falls, etc. #1 - Ave Maria Islet (Near Sitio Lusay, Marine Reserve Area of Jordan): has a small sandbar with powdery white sand perfect for sunbathing and photo ops; next to its crystal clear blue water excellent for swimming, snorkeling plus cliff diving. On top of that, be greeted by the warm and friendly locals there in addition to having a restaurant nearby to cater to your hungry tummy. 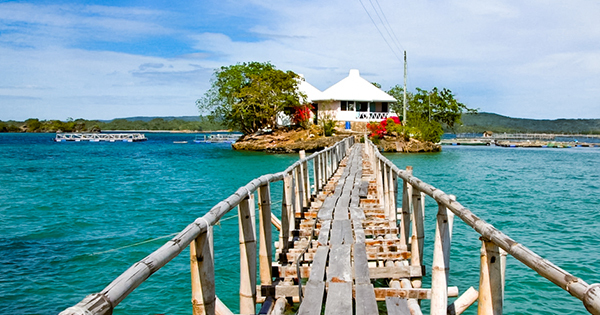 Indeed a superb island hopping stopover to discover! #2 - Guisi Beach (Nueva Valencia): For some peace and quiet time, savor Guisi Beach which also has white sand, lots of corals, clear water and hotels nearby to stay at. Swimming is thus the relaxing thing to do there along with some trekking up to the lighthouse not so far away. #3 - Marine Reserve Area (Sitio Lusay, Lawi, Jordan): This is part of the Guimaras Island hopping tour, an absolutely educational and memorable experience for you and your kids as you get to be acquainted with the various marine species and how they are cultured. Never miss this great opportunity to see cute turtles, huge groupers, sea bass, snapper, jack fish, starfish, sea horses, and many more! #4 - Roca Encantada (Buenavista): Literally a house built in 1910 upon a rock amidst a clear blue sea, Roca Encantada is a heritage house that used to be the vacation home of the Lopez family in honor of the late Dona Presentacion Hofilena Lopez. The interior may be prohibited from being entered, yet visitors can freely go around this house and even take photos from its terrace that is overlooking the awesome sea -- surrounding this truly enchanting place so rich in history! #5 - Tatlong Pulo Beach (Sinapsapan, Jordan): It costs very little to enjoy very much in Tatlong Pulo Beach -- what with its crystal clear water perfect for swimming in addition to its uber relaxing white sand where you can just chill with your friends or family under the moonlight with some beers and barbecues. Otherwise, just enjoy a day trip with exciting island hopping over to the island just across after renting a boat to take you there. Amazing, we swear! #6 - Buho Ramirez Cave (Lawi, Jordan): If you are a fearless adventure seeker looking for an escape from the hot outdoors, then rent a boat plus a tour guide to take you to the inside of Buho Ramirez Cave, where many fruit bats hang from its ceiling as well as cool swimming into its clear pool of water will surely freshen you and your company up from the scorching weather of summer! Now, that's super!